Millions of viewers tuned in each week to watch as Sir David Attenborough guided us through some of the most incredible natural habitats on Earth in BBC series Planet Earth II. If you didn't miss an episode, perhaps consider including some of the programme's filming locations on your next superyacht itinerary. 1. The Galapagos Islands In the program: Perhaps one of the most talked about events from the show was the Galapagos racer snakes hunting down hatchling marine iguanas — the crew managed to capture scenes of the baby iguanas emerging from under the sand and scurrying to meet their parents at the edge of the Pacific Ocean. 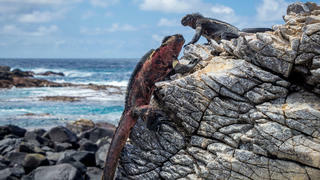 How to visit: Visiting the UNESCO World Heritage site by superyacht is difficult, but not impossible, especially as there are now luxury charter yachts available in the Galapagos Islands, complete with professional guides. The national park service regulates visitors on the islands, therefore tours and dives must be organised through local companies. What to see: The Galapagos is famous for its mixing pot of wildlife — look out for the extraordinary numbers of hammerhead sharks and eagle rays, as well as the marine iguana, the Galapagos tortoise, the endemic flightless cormorants, the Galapagos land iguanas and the green sea turtles. Millions of viewers tuned in each week to watch as Sir David Attenborough guided us through some of the most incredible natural habitats on Earth in BBC series Planet Earth II. If you didn't miss an episode, perhaps consider including some of the programme's filming locations on your next superyacht itinerary. Perhaps one of the most talked about events from the show was the Galapagos racer snakes hunting down hatchling marine iguanas — the crew managed to capture scenes of the baby iguanas emerging from under the sand and scurrying to meet their parents at the edge of the Pacific Ocean. How to visit: Visiting the UNESCO World Heritage site by superyacht is difficult, but not impossible, especially as there are now luxury charter yachts available in the Galapagos Islands, complete with professional guides. The national park service regulates visitors on the islands, therefore tours and dives must be organised through local companies. What to see: The Galapagos is famous for its mixing pot of wildlife — look out for the extraordinary numbers of hammerhead sharks and eagle rays, as well as the marine iguana, the Galapagos tortoise, the endemic flightless cormorants, the Galapagos land iguanas and the green sea turtles. In the program: Who could forget the bizarre activities of the James’ flamingo? Also known as the puna flamingo, these birds populate the high altitudes Andean plateaus of Chile, Pero, Bolivia and Argentina. In this episode, we saw them break free from the ice, which encased their legs while they slept before they clustered together to parade around the lake. How to visit: Superyachts measuring up to 230 metres LOA can moor at Puerto Montt and there are a number of good anchorages up the coast. What to see: If you have the time, a visit to Easter Island is a must and if you travel up the coast, there are a number of luxury excursions to the Atacama desert from Santiago so you can see flamingos, salt lakes and salt flats. There are many ways to explore the mountains, either by bike, on foot, or by a private helicopter tour. In the program: Who could forget the bizarre activities of the James’ flamingo? 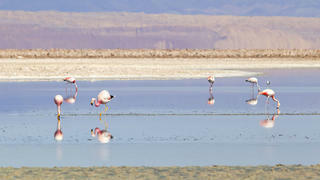 Also known as the puna flamingo, these birds populate the high altitudes Andean plateaus of Chile, Pero, Bolivia and Argentina. In this episode, we saw them break free from the ice, which encased their legs while they slept before they clustered together to parade around the lake. How to visit: Superyachts measuring up to 230 metres LOA can moor at Puerto Montt and there are a number of good anchorages up the coast. What to see: If you have the time, a visit to Easter Island is a must and if you travel up the coast, there are a number of luxury excursions to the Atacama desert from Santiago so you can see flamingos, salt lakes and salt flats. There are many ways to explore the mountains, either by bike, on foot, or by a private helicopter tour. In the program: Among the many creatures we were introduced to in episode three was the seemingly fearless glass frog, which is no bigger than a human thumbnail. We watched as he beat the predatory wasps away from his eggs with his feet. How to visit: The Costa Rican coastlines are well worth the trip and there are a number of charter yachts available — fly to Liberia International Airport and have your chauffer drive you to Marina Papagayo to meet your yacht. From there explore the beautiful coastlines and visit the tiny islands of Islas Murcielago and San Jose. 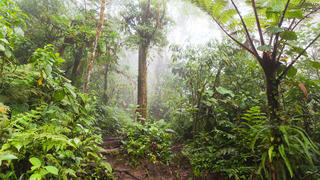 What to see: Make sure to request trips to the Santa Rosa National Park to witness a vibrant Costa Rican jungle environment and don’t miss the waterfalls at the Volcan Rincon de la Vieja — a must for anyone exploring Costa Rica by charter yacht. In the program: Among the many creatures we were introduced to in episode three was the seemingly fearless glass frog, which is no bigger than a human thumbnail. We watched as he beat the predatory wasps away from his eggs with his feet. How to visit: The Costa Rican coastlines are well worth the trip and there are a number of charter yachts available — fly to Liberia International Airport and have your chauffer drive you to Marina Papagayo to meet your yacht. From there explore the beautiful coastlines and visit the tiny islands of Islas Murcielago and San Jose. What to see: Make sure to request trips to the Santa Rosa National Park to witness a vibrant Costa Rican jungle environment and don’t miss the waterfalls at the Volcan Rincon de la Vieja — a must for anyone exploring Costa Rica by charter yacht. In the program: Wild horses in Nevada battled it out while Harris hawks hunted down their prey as a pack. How to visit: Though most deserts will be a bit of a stretch to visit by luxury yacht, head to San Francisco Bay, where there are a number of berthing options for superyachts up to 195 metres. Explore the city or take the superyacht helicopter for a spin to visit Nevada. What to see: The city is home to its own wildlife — the sea lions at pier 39 are a real San Francisco hotspot. Additionally, don’t miss the world-famous Golden Gate Bridge or Alcatraz Island. 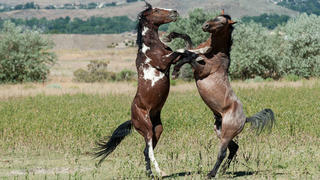 In the program: Wild horses in Nevada battled it out while Harris hawks hunted down their prey as a pack. How to visit: Though most deserts will be a bit of a stretch to visit by luxury yacht, head to San Francisco Bay, where there are a number of berthing options for superyachts up to 195 metres. Explore the city or take the superyacht helicopter for a spin to visit Nevada. What to see: The city is home to its own wildlife — the sea lions at pier 39 are a real San Francisco hotspot. Additionally, don’t miss the world-famous Golden Gate Bridge or Alcatraz Island. 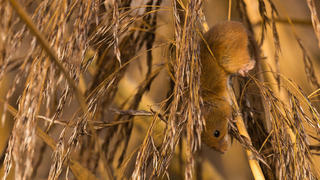 In the program: A brave harvest mouse clambered through blades of grass in a wild meadow in Norfolk, UK. While it may not be as action-packed as some of the other episode highlights, these mice stole our hearts. How to visit: Moor up in London and have your helicopter take you outside the city to see beautiful grasslands of Norfolk. What to see: If the meadows of Norfolk are a little too far afield, opt for an Area of Natural Beauty that’s closer to London, such as The Cotswolds, the South Downs, High Weald or the Surrey Hills. Nature can be found in London too — don’t miss the deer at Richmond Park or the stunning views from Hampstead Heath. In the program: A brave harvest mouse clambered through blades of grass in a wild meadow in Norfolk, UK. While it may not be as action-packed as some of the other episode highlights, these mice stole our hearts. How to visit: Moor up in London and have your helicopter take you outside the city to see beautiful grasslands of Norfolk. What to see: If the meadows of Norfolk are a little too far afield, opt for an Area of Natural Beauty that’s closer to London, such as The Cotswolds, the South Downs, High Weald or the Surrey Hills. Nature can be found in London too — don’t miss the deer at Richmond Park or the stunning views from Hampstead Heath. 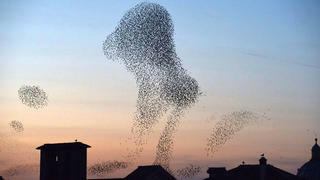 In the program: We watched enormous flocks of starlings dancing through the skies above Rome, performing incredible aerial displays in the final episode of Planet Earth II, Cities. How to visit: Superyachts can moor at Roma Marina Yachting, located in the 2,000-year-old port town of Civitavecchia. It can berth some of the world’s largests yachts along the 230 metre face dock and has 14 superyacht berths. What to see: Starlings aside, the collection of ancient architecture in Rome is second to none — if you're on a luxury yacht charter in Italy, head to the Colosseum, Pantheon and the Basilica di Santa Maria Maggiore before selecting one of the hundreds of amazing family-run restaurants offering the best Italian wines and dishes. In the program: We watched enormous flocks of starlings dancing through the skies above Rome, performing incredible aerial displays in the final episode of Planet Earth II, Cities. How to visit: Superyachts can moor at Roma Marina Yachting, located in the 2,000-year-old port town of Civitavecchia. It can berth some of the world’s largests yachts along the 230 metre face dock and has 14 superyacht berths. What to see: Starlings aside, the collection of ancient architecture in Rome is second to none — if you're on a luxury yacht charter in Italy, head to the Colosseum, Pantheon and the Basilica di Santa Maria Maggiore before selecting one of the hundreds of amazing family-run restaurants offering the best Italian wines and dishes.